Welcome to the Beautiful World. A site dedicated to the anime, manga and game for the Kino no Tabi ~the Beautiful World~ series which also claims the english title Kino's Journey. Some may also refer to it as Kino's Travels. Here you can find some information relating to the series and some of the products available in relation to this series. Aswell as plenty of resources such as images and other fun stuff. I hope you enjoy your visit. Hello, sorry for the severe lack of updates. Along with Uni work any site updates I\'ve had time to do has been going to my Alien 9 website. I\'m not sure if and when I\'ll be able to update this site again (either way I\'ll be keeping the content up). 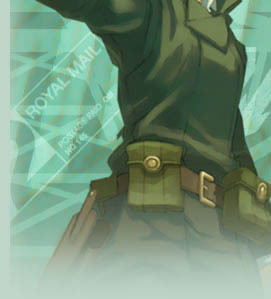 I still adore Kino no Tabi of course. In the meantime I advise people to check out Ming-Ling\'s website (listed above in the Affiliates). There\'s been news of a new movie for the Kino series apparently, sounds interesting. Finally managed to fix the guestbook, should hopefully work fine now. Sorry for not updating, the site's been pretty up and down lately due to technical difficulties. Added information on a product to the Soundtracks section. It is an album called Reverie which features music inspired by the Kino no Tabi novels. You can also find the tracklisting for this album in the Media section. I apologise for the recent downtime. My webhost has been having some difficulties. Hopefully all will be stable again come September. Until then I apologise if you can't seem to access. Thank you for your patience. Added info and images for the final 2 English DVDs. Also added a bunch of new collectibles info and images, as well as added images to previously listed collectibles. Both updates can be found in the Products section. I actually managed to purchase the Kino's Journey Music Box (was expensive though ^^; ) so I'll add images and info for that at a later date. Here's a new layout. I feel this is much betetr than the last one, mainly because it doesn't use frames so it should be more search engine safe and so on. It's also more clean and simple. It took me ages to figure out getting the text to flow around the right image, but it turned out to be simple in the end! (something like setting hspace to 0 when I thought it'd be some kind of complicated CSS positioning thing...) Hopefully it works in your browser... I think I tried it with Mozilla Firefox and Internet Explorer... Anyway I'm afraid there's no updates to go with the layout because I was busy with my Alien 9 fansite (which has had a big update). Katu Fushigi has kindly submitted two pieces of fanwork to me. Firstly a piece of fanfiction entitled "The Country of Memories", an interesting story very fitting for the world of Kino, and secondly a lovely piece of fanart featuring Kino. I have promptly put up both under the Fan section for you to enjoy. Katu has also mentioned that another piece of fanfiction may be in the works. In other news, I'm working on a new layout. I'm just having a little difficulty with aligning an image to the right within a table, a seemingly simple task which surprisngly causes a compatibility issue for me as Internet Explorer seems to add a slight gap, whilst Mozilla FireFox does not. I've tried standard HTML and CSS but both methods seem to have the gap. Hopefully I can work this kink out (I prefer it if it's compatible for both browsers), I'd like to give this place a new and cleaner look. Also my Kino no Tabi - Their Memories book should be on it's way now. However I need to wait before purchasing any Kino DVDs, shouldn't be too long though hopefully. I have, however, updated the information on the English DVDs, with prices, images and so on over in the Products section. Yep I'm still alive... what you already knew that? Anyway the first DVD is obviously out but I haven't had the chance to purchase it yet unfortunately. But that shouldn't be too long from now... (hopefully). Once I have that I can make a DVD gallery similar to the one on my Alien 9 fansite and start some episode descriptions and so on. I'd really love to re-work this layout aswell... But that will take time. Also my Kino Memories book/collection was delayed so no go there either. Oh also Ming-Ling has her Kino fansite up, and it's looking great! I was waiting to be able to link it and I'm honoured to see I was linked there. I'll try and return the favour a.s.a.p. Meanwhile back to work... When I get a break I'll hopefully be able to update. This is a fansite and is not affliated with the original producers.